The semester went over in a very big way! Your book was the talk of the class. I'm going to reverse my lesson plan, and have them read your book first and then study the history of terrorism. I can then relate back to the story. Looks like I will be getting more and more involved here at Eastern Kentucky University both in leadership development and teaching the history of terrorism. Here's a "must read" for everyone. Written by my friend, Major Frank Stotz. Frank is a retired Marine Corps Major who spent over 13-years in Saudi working for ARAMCO. He did not waste his time, but rather studied the culture, and possible results of the "Revolt of the Muslim Community" with Weapons of Mass Destruction. His book ("WMD Attacks on America") is a must read for those who would be prepared for what may be in the wind (no pun intended). It is partly a thinly disguised Novel of what "could happen" and some down-to-earth advice on how to survive in the event that it does! Frank is a very down to earth gentleman who has his "stuff in one seabag" - definitely worth the read. Highly recommended, but not for the faint of heart! ...a lot of good, factual, helpful information wrapped cleverly in a thought-provoking scenario that could easily become a reality. It provides a vehicle by which those of little insight into how the government works or what the military is all about or what the options in WMD are, can become at least conversant in such matters and begin to think about the consequences so as to be prepared if they so choose, and be inspired to seek more information. Major Stolz has skillfully mixed fact with fiction to produce a spellbinding story of the results of WMD. His perspective, knowledge, and advice provide a lesson in preparedness for government and the private sector. This book should be of particular interest to the healthcare community, and provides an excellent primer on preparation to care for the casualties of WMD, as well as the risks faced by healthcare providers. Major Stolz's excellent information should be understood by every healthcare provider in the country, and those providers should work to ensure appropriate readiness against attack. The book is great! Your book, It is safe to say, is professionally conceived, organized and written! It is a jewel and a primer for what may well be on the horizon for us all. Just what is expected from a couple of PROFESSIONALS. I began the book a couple of nights ago--it is a spell binder and has such an immediate impact on what is going on today; not only in our county--but, in the world at large. I have reviewed the back of the book and the list of survival actions and items--bouncing this info off what we currently have in the house to rely upon during the first critical days--when the only person looking out for a citizen and his family--it the citizen himself. There are so many facets to your and Jim's written comments and observations--The book has immediate application to the Military, Law Enforcement, Emergency Planners and the Regular Feller who just wants to give his family a descent chance in this day of WMD's. As you said; "It is not if, but, when!" With the Warmest of Regards, Deepest Respect and Heartfelt Admiration for what you and Jim did, have done and continue to do for our country and her citizens. I couldn't put it down. Not only does he provide a plausible scenario for multi-threats by those who have chosen to become our enemy, but also he leaves us with hope that the religious, ethnic, political, economic and educational games (policies) may some day be seen in the light of truth. The "preparedness" suggestions he offers may prove as further recognition of our own personal need to take actions necessary to minimize the burden on our "first responders" at the height of conflict or event. One must acquire personal responsibility for himself and those in his charge. I believe America is becoming very complacent at the average citizen level. Like the Roman Empire, we don't think it can happen to us. For some six months after 911, if it didn't directly and personally effect certain people they forgot about it. Some people just do not want to hear bad news, consequently, they will not be prepared for any future events like 911. The Roman Empire fell because, like Troy, they also allowed themselves to be tricked by a Trojan Horse. We all know our modern day Trojan Horse comes in the shape of our Northern, and more likely our Southern Boarders. 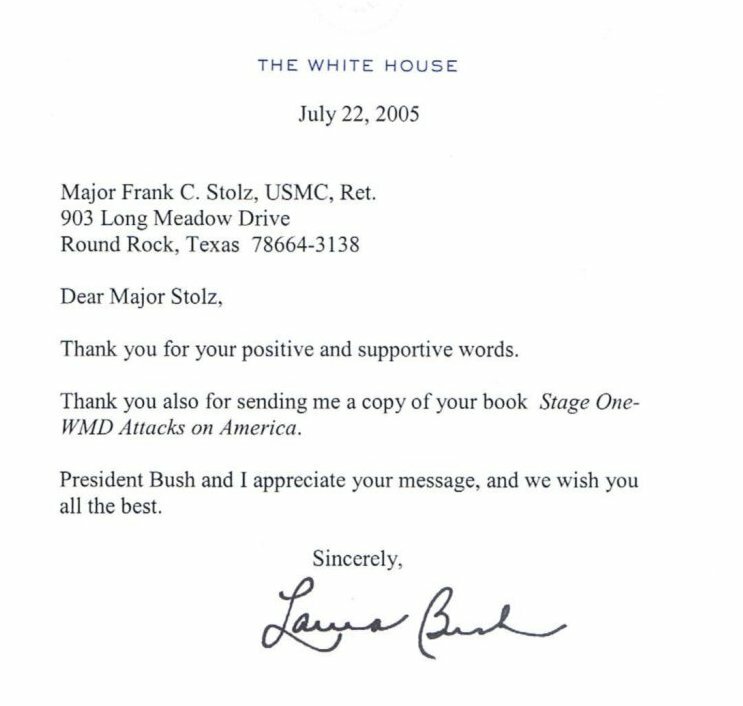 I have just read WMD Attacks on America written by Major Frank C. Stolz USMC (Ret). This is an OUTSTANDING fictional account of very realistic scenarios and is a WAKE UP call for all levels of Americans, READ-IT ! I was honored to have served with Maj. Stolz in 1965 as his Platoon Sgt. in F/2/3. I can absolutely say, with NOT the slightest reservation, that he was the finest 2nd Lieutenant I ever served with in my entire career, and especially in a Combat. Many in our land live in fear of an attack with weapons of mass destruction . In his book "WMD Attacks on America", Frank C. Stolz, a retired Marine major, gives us an imaginary, but very realistic and comprehensive picture of such attacks, both biological and nuclear. In addition, there is a section devoted to the medical and other information one needs to prepare for such attacks. With his distinguished career over twenty years in the Marine Corp, Major Stolz is uniquely qualified to portray every aspect of such attacks including White House decision making, relations with other nations, and the destruction and its effects on our cities and populations. Highly recommended as especially relevant to our times. "A fascinating read and a very important book for government officials, military leaders, medical personnel, law enforcement officials, and the general public. While a frightening and spell-binding page-turner, it is very much a current events novel, combined with a non-fiction portion for civilian WMD agent protection and safety. It is also a call to our nation's leaders to prepare to protect the USA and our people from possible WMD events." USMA Class of 1942, WWII (Burma Theater) and Vietnam Veteran; former Head of the Nevada Office of the Atomic Energy Commission; Senior Vice President (Operations), the Southwest Research Institute. I am concerned for the safety of America, having finished "WMD Attacks on America" by Major Frank Stolz, USMC (Ret). His in-depth knowledge of the subject and insights into the psyches of terrorists who want to destroy our country -- and how we would react are uncanny! His novel, used as a vehicle to demonstrate a simple and workable approach to an upcoming Biological and Chemical attack by those who want to subjugate their way of life on the American people, is informative, frightening, and realistic. Buy this book and read Major Stolz’s haunting story, and his "Home Remedies and Protection from WMD Incidents" at the end of his masterpiece of intrigue! Moreover, I recommend "WMD Attacks on America" for every American who values the survival of our Nation from the Islamic Jihadists and others who are hell bent to destroy our values and freedom. The bell tolls the eleventh hour for America. We are at War! Great job both with the exciting and intriguing story portion, as well as with the Home remedies section. This is an important book as it graphically points out the inadequacy of our preparations for a WMD attack on our soil. The second half of the book lists in detail how civilian households can protect themselves from such a catastrophe, filling a void left by the government's failure to provide such info. The first half is an exciting scenario which dramatically depicts what realistically could well occur if our homeland security at all levels is not soon enlightened to the facts of the threat faced by our nation. It provides a needed wake-up call to the citizens as to the true state of our unprepared ness for such an emergency. Hopefully it will provoke prompt remedial action by responsible officials. In any case this book serves as a vital reference to keep readily at hand. I just finished your book. Simply put, it was one of my better book buys of the last 10 years. I'm trying to get some local print and radio folks to read it. Thanks again for a good read and great character names like Carmine DeBona. This is a must read for every American. Should the USA, one day, suffer a WMD attack, the knowledge provided in this book will save many thousands of lives and untold suffering. Why our government has not provided similar important information is a mystery. We should be thankful that a retired Marine has come to the aid of his countrymen…and has provided a timely, important, interesting read, and a splendid public service. Mr. Arnett is also former Director, California Department of Fish & Game, and former Assistant Secretary for Fish & Wildlife and Parks, Department of the Interior.